Forget the past, Ferrari still rules today. Clearly the most famous F1 team in the world Ferrari has quite nearly perfected the way to the podium and it shows. Since 1950 the team has been made the world champions no less than twelve times during the years of 1961, 1964, 1975, 1976, 1977, 1979, 1982, 1983, and more recently since 1999 till the year 2002. 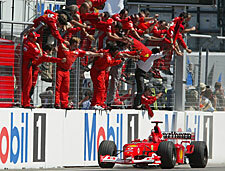 Ferrari is clearly the king of F1 racing with a record 159 F1 victories and 3766 points won. 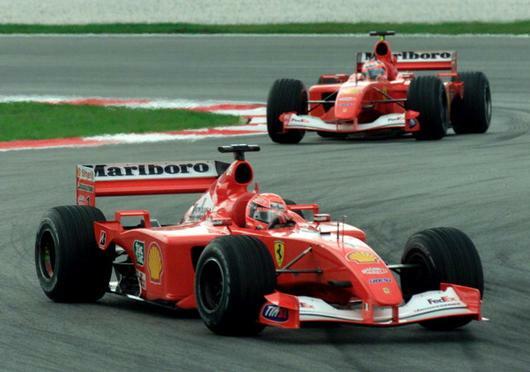 Consistency and innovation is Ferrari and then ofcourse there is Michael Schumacher. Need we say more? Yes indeed; for through these lines it is still impossible to forget Luca Di Montezemolo, the Ferrari Boss and the one who has headed this company and the team since he took over in 1991. Enzo Ferrari apart, he is perhaps the greatest motivation to Ferrari. So what lies in store for Ferrari in this season of F1 racing? An outright victory? Yes perhaps. A few more controversies? Certainly. Champaigne? Why ofcourse! Ferrari has come with a brilliant car for 2003 and it roars. Give it to Schumacher and watch it literally pull the tarmac away from the wheels of the other car in the F1 line-up. The quickest, fastest and tecknologically most advanced car has cost a lot of investment both in terms of extensive man-hours and monetary investments. And the team will be expecting results. Thanks to the team of Michael Schumacher and Rubens Barrichelo Ferrari can hope to recreate the magic of the last F1 season and the three seasons preceeding that. However with new legislations being drafted in the F1 corridors too many innovations might work against the Ferrari team. Cutting down of expenses might work well for the less developed teams but for the developed ones like Ferrari it could mean certain loss of position. Also with new restrictions being imposed on the F1 cars especially with regard to their aerodynamic capabilities it seems that Ferrari might have to come up with something new to counter or at least balance the effects of the dictats. However one would expect these norms to be uniform. In that case Ferrari has good reasons to cheer. Their cars are the best anyways. And if all the F1 cars are detuned in equal measures Ferrari will still remain leagues ahead. Watch this space for more and in the meantime keep your fingers crossed.